The International Amateur Radio Union (IARU) has welcomed the exclusion of all existing Amateur and Amateur-Satellite frequency allocations from bands under possible consideration at World Radiocommunication Conference 2019 (WRC-19) for non-amateur satellite use. WRC-15 last month in Geneva recommended WRC-19 Agenda Item 1.7 regarding spectrum studies for short-mission satellites; it removes from consideration the Amateur-Satellite allocations at 2 meters and 70 centimeters. "This is an excellent result for the amateur services and clearly shows that non-amateur satellite constructors need to consider spectrum other than the very limited and congested segments that are available for amateur satellites at 144 MHz and 435 MHz," said IARU President Tim Ellam, VE6SH/G4HUA. Agenda Item 1.7 calls on delegates "to study the spectrum needs for telemetry, tracking, and command in the space operation service for non-GSO [geosynchronous] satellites with short-duration missions, to assess the suitability of existing allocations to the space operation service and, if necessary, to consider new allocations, in accordance with Resolution COM6/19 (WRC-15)." Resolution COM6/19 specifies 150.05-174 MHz and 400.15-420 MHz as the frequency ranges that may be considered for possible new allocations. One factor the conference considered in deciding on those particular frequency ranges was that, contrary to the provisions of the ITU Radio Regulations defining the Amateur and Amateur-Satellite services, "some non-amateur satellites have used frequencies for telemetry, tracking, and command in the frequency bands 144-146 MHz and 435-438 MHz which are allocated to the Amateur-Satellite Service." A 2-day Military Auxiliary Radio System (MARS) communications exercise in early November is being considered an overall success, especially in terms of MARS-ARES cooperation. The November 8-10 exercise was built around a scenario of a simulated massive coronal mass ejection (CME) that disrupts conventional communication systems across the US. Following the simulated CME, MARS stations returned to the air and received requests for information from the supported Department of Defense (DoD) organizations asking MARS stations to establish contact with Amateur Radio operators in as many of the 3142 US counties as possible. MARS operators were limited primarily to HF NVIS bands and to VHF and UHF repeaters. Communication between MARS and Amateur Radio operators was to be made directly, without relying on Internet-linking capabilities or store-and-forward messaging systems. "Data analysis following the exercise shows that MARS members successfully contacted 816 counties across the US (26 percent)," US Army MARS Program Manager Paul English, WD8DBY, told ARRL. "Amateur Radio participants in this exercise included individuals, Amateur Radio Emergency Service (ARES)-affiliated clubs, and the Salvation Army Team Emergency Radio Network (SATERN), as well as a few state, county, and city emergency operations centers." English credited advance publicity given to the exercise by ARRL and others for MARS exercise planners having received 181 e-mail inquiries from individual, clubs, and emergency management personnel wanting to receive more information about the exercise and how they could participate. English said MARS received inquiries from 41 states, which included more than 50 ARES groups. "The purpose of these exercises is to reach beyond interoperability and focus on our ability to exchange usable and relevant information from the local level to the national level following a crisis event," English explained. "Only through the cooperation among MARS and the larger Amateur Radio community (individuals, ARES, RACES, SATERN, etc) can we hope to achieve that synergy." Read more. In the wake of severe flooding in Southern India resulting from several days of torrential downpours earlier this month, volunteer radio amateurs jumped in to provide emergency communication and other disaster assistance. Amateur Radio Society of India (ARSI) President Gopal Madhavan, VU2GMN, said hams swung into action soon after flood waters -- 3 to 4 meters deep in some places -- overwhelmed India's fourth-largest city, Chennai, and the surrounding region. Power outages in many parts of the affected area hampered Amateur Radio relief operations, and some radio amateurs were caught in the flooding. Hams with emergency power were able to pitch in, however, via two local repeaters. An HF network remained on standby. Local hams, several belonging to the South India Amateur Radio Society (SIARS) in Chennai, contributed to relief and rescue operations, working in part with ALERT, a non-governmental relief organization. "Once it became possible to move, hams started going out assisting with delivery of food and water to stranded individuals and assisting with rescue from tall buildings, where people were trapped," Madhavan said. ARSI National Coordinator for Disaster Communication Jayu Bhide, VU2JAU, said the flooding was one of the city's worst disasters and was unexpected in a metropolitan area. Most of the cell phone network, Internet, and other communication systems were knocked out due to power failure and flooding. The emergency network supported communication for distributing food, tracing missing people, and providing other assistance as needed. With the conventional communication infrastructure disrupted, ham radio was a mainstay. The flooding also cut off access to several bridges, dividing the city. The deadline to submit nominations for the 2015 ARRL International Humanitarian Award is Thursday, December 31. The award is conferred upon an amateur or group of amateurs who demonstrate devotion to human welfare, peace, and international understanding through Amateur Radio. The League established the annual prize to recognize Amateur Radio operators who have used ham radio to provide extraordinary service to others in times of crisis or disaster. A committee appointed by the League's President is now accepting nominations from Amateur Radio, governmental, or other organizations that have benefited from extraordinary service rendered by an Amateur Radio operator or group. The ARRL International Humanitarian Award recognizes Amateur Radio's unique role in international communication and the assistance amateurs regularly provide to people in need. Nominations should include a summary of the nominee's actions that qualify the individual (or individuals) for this award, plus verifying statements from at least two people having first-hand knowledge of the events warranting the nomination. These statements may be from an official of a group (for example, the American Red Cross, The Salvation Army, a local or state emergency management official) that benefited from the nominee's particular Amateur Radio contribution. Nominations should include the names and addresses of all references. All nominations and supporting materials for the 2015 ARRL International Humanitarian Award must be submitted in writing in English to ARRL International Humanitarian Award, 225 Main St, Newington, CT 06111 USA. The winner of the ARRL International Humanitarian Award receives an engraved plaque and a profile in QST and other ARRL venues. National pride is at a "Peake" in the UK, as European Space Agency Astronaut Tim Peake, KG5BVI, counts down the days until he launches from Kazakhstan to the International Space Station (ISS). The English-born Peake -- a former British Army Air Corps officer and helicopter pilot -- will lift off aboard a Soyuz spacecraft on December 15 as part of the Expedition 46 crew. Through his Principia Mission, Peake will dedicate part of his schedule in space to educational activities for youngsters on Earth. The mission is named for Isaac Newton's text, PhilosophÃ¦ Naturalis Principia Mathematica (Mathematical Principles of Natural Philosophy). Peake will spend 6 months in orbit on the ISS, mostly working in the Columbus laboratory module. UK Astronaut Tim Peake, KG5BVI, begins his Principia Mission on December 15. "I'm extremely proud to say that Mission Pricipia is the largest and most ambitious educational outreach program of any European space mission," Peake said in a pre-flight video. In the video, he thanked the Amateur Radio on the International Space Station (ARISS) program, the UK Space Agency, the ESA, and others on a long list of supporting educational institutions and organizations. As part of Peake's educational efforts, a pair of Astro-Pi computers will head separately to the ISS for use in various sensor experiments. "Send your code to me, and I'll run it for you onboard the space station," Peake has invited. He'll also be taking along some seeds to grow in space to compare the results with similar seeds grown on Earth. "Also, I'm really looking forward to talking to many schools using the Amateur Radio system that we have on board the space station," Peake said, referring to ARISS, in a mission overview video posted on the Principia Mission website. Working with the UK Space Agency, ARISS is giving a number of UK schools the opportunity to speak directly with Peake. Initial ARISS school contacts with Peake at the mic will take place in January. 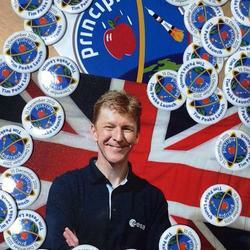 Part of the Principia UK team, including Ciaran Morgan, M0XTD, Graham Shirville, G3VZV, and Noel Matthews, G8GTZ, will be joined by RSGB General Manager Graham Coomber, G0NBI, at the "Principia Partners" booth for the official Tim Peake launch party at the London Science Museum. Accompanying Peake on his ride to the ISS will be NASA astronaut Tim Kopra, KE5UDN, and Russian Cosmonaut Yuri Malenchenko, RK3DUP. While on station, Peake will carry out an intensive schedule of European and international experiments, in addition to his numerous educational activities. Peake, 43, is the first British citizen to be selected as an astronaut by ESA. Read more. Despite what the Boy Scouts of America (BSA) called "solid results from an exciting JOTA weekend," Scout participation for the October 2015 event was reported down by 8 percent from 2014, although the number of registered stations and station reports remained about the same. The BSA said 7117 Scouts took part in JOTA 2015. The number of visitors, at 5138, was also down by 8 percent. The Boy Scouts said only 60 percent of registered stations -- 208 -- filed a station report, so the report may represent only part of the activity and could be updated if additional information comes in. The 346 total stations registered for JOTA 2015 represented a slight improvement from 2014, however. "The total number of Scout councils involved dropped from 149 to 127," said the report posted by National Jamboree On The Air Organizer Jim Wilson, K5ND. "Therein lies our big challenge -- getting the word out to local Scout councils about the biggest Scouting event in the world and how they can participate." On a more positive note, 208 JOTA-participating stations have filed reports. That's up 1 percent over last year's event. In all, JOTA stations worked 106 countries, as 979 Amateur Radio operators put 847 radios on the air to make 8360 contacts -- all up from 2014. "The most memorable thing was the Scouts who absolutely said they weren't getting on the air. But when they did, you couldn't pry the mic out of their hands," said Philip Jacobs, W2GSB, at the K2S JOTA special event station. "They turned out to be some of the best Scout ops we had." The Scouts blamed persistent challenges from propagation, contesting, a lack of council involvement, and failing to get information to those who needed it. "Propagation and contesting will remain ongoing problems. "Changes to the Worked All Germany contest to reserve JOTA frequencies have been helpful," the Scouts reported. "[We] need to activate a similar arrangement with USA-based QSO Parties in New York, Iowa, Illinois, and South Dakota." Looking ahead to JOTA 2016, the Scouts are planning "consistent, persistent, and even relentless communication...to increase awareness of available information." JOTA 2015 took place over the October 16-18 weekend. Read more. Len Frantz, K4KBD, staffed the Wiregrass Trail aid station during the 2015 Cottonmouth 100.
repeater, W4AAV -- in providing communication support at six aid stations as well as at the start and finish lines. The race, with 150 runners, took place in part of two counties in a wooded area encompassing nearly 200,000 acres in the Blackwater River State Forest Bear Lake Recreation Area. "The original plan called for reporting only the first male and female runners arriving at each aid station," said the after-action report prepared by Santa Rosa County Assistant Emergency Coordinator Daisy Crepeau, KT4KW. "Because many were interested in runner progress, it was quickly changed so that each aid station reported each runner's number as they came through each aid station. This change assisted in tracking runners. A large portion of the race occurred in darkness, and there needed to be a way to account for each runner, in case someone was hurt or lost. This change proved invaluable." The plan called for using simplex as much as possible and only using the repeater for those aid stations that could not be heard on simplex. Among lessons learned was a need for more operators and a backup net control station, as well as a runner at net control. "Overall the event was a resounding success," Crepeau said in her report. Read more. The popular ARRL 10 Meter Contest takes place over the December 12-13 weekend, offering lots of fun for operators on any level, and you never know what sort of propagation you might encounter on 10 meters. Tom Roscoe, K8CX, had a terrific time operating the ARRL 10 Meter Contest from Aruba as P40CX in 2014. The ARRL encourages computer loggers to check out the new web-based log uploading facility. It offers quick response and instant feedback, and if your log has a problem, you'll be able to fix it on the fly and upload the log again on the spot. For paper loggers or for those using software that does not generate a Cabrillo file, there is a convenient data entry service that converts your log data into Cabrillo format and forwards it to the ARRL's log handling service. You also can still submit your log via e-mail. Whichever method is more convenient, be sure to submit a log, even if you only made a few contacts. It improves the quality of the log checking, and you might even find yourself in line for a certificate! Post any soapbox comments and photos to ARRL's Soapbox page. DXpeditioner Dom Grzyb, 3Z9DX, plans to travel to North Korea later this month to discuss his proposed Amateur Radio operation from that country. North Korea (P5), the most-wanted DXCC entity, has not been activated since Ed Giorgadze, 4L4FN, operated for about a year from the capital city of Pyongyang in 2001-2002. Grzyb expects to arrive in North Korea just before Christmas for what are being called "high-level talks" with government officials regarding his hope to operate from the secretive communist country in January or February of 2016. 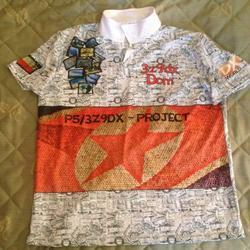 Dom Gryzb, 3Z9DX, hopes to return from North Korea in 2016 with more than just a DXpedition t-shirt. He is taking Amateur Radio gear with him on this month's visit, although he will not be on the air. The equipment will remain in North Korea for his planned P5 operation and will be left there afterward for possible future Amateur Radio operations. Grzyb expects to be in Pyongyang for up to 5 days. According to Grzyb, he has received authorization to operate on three bands, but he plans to concentrate his activity on 20 meter SSB. No CW operation is planned. If 3Z9DX is permitted on the air from North Korea, his operation will be very closely monitored by government officials. He may only run 100 W into a vertical antenna. international Table of Allocations, but only on a non-interference, non-protected basis. 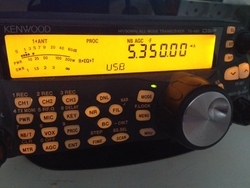 Hams in the Netherlands have been authorized to use 5350-5450 MHz at up to 100 W PEP. The Netherlands' IARU member society VERON has recommended the use of USB. The Yasme Foundation Board of Directors has named the N1MM Logger+ logging software development team to receive its Yasme Excellence Award. Team members include Tom Wagner, N1MM; Rick Ellison, N2AMG; Steve London, N2IC; John Bednar, K3CT; Nikolay Safronov, NA3M; Pete Smith, N4ZR; Andreas Hofman, KU7T; Larry Gauthier, K8UT, and Richard Ferch, VE3KI. The Yasme Excellence Award recognizes an individual or individuals who, through their own service, creativity, effort, and dedication, have made a significant contribution to Amateur Radio. "The contribution may be in recognition of technical, operating, or organizational achievement, as all three are necessary for Amateur Radio to grow and prosper," the Yasme Foundation announcement said. N1MM+ is a major revision to the original N1MM Logger program, involving a volunteer effort to rewrite and test more than more than 250,000 lines of code. The program continues to be available free, and is updated and supported on a regular basis. Ham Radio Outlet (HRO) Founder Robert G. "Bob" Ferrero, W6RJ (ex-K6AHV), of Danville, California, died on December 4 after a period of ill health. He was 78. An ARRL Life Member, Ferrero was a California state trooper and US Navy veteran when he acquired Ham Radio Outlet in Burlingame, California, in 1971. He characterized the original store as a "little radio emporium on a wooden train platform." HRO is now the world's largest Amateur Radio retail chain. Ferrero took part in DXpeditions to Kingman Reef in 1974, the Austral and Marquesas Islands, and the now-deleted Bajo Nuevo and Serrana Bank. He also operated as 9J2RA, TJ1GB, and W6RJ/Z2, as well as from HZ1AB in the 1980s and early 1990s. Ferrero was inducted into the CQ DX Hall of Fame in 1997 and into the CQ Amateur Radio Hall of Fame in 2005. He was a member of the A1 Operators Club. In 2009, the editors of CQ, in conjunction with the Visalia DX Convention, recognized Ferrero "for his many contributions to Amateur Radio." He was among the initial patrons and a significant supporter of the Northern California DX Foundation (NCDXF). Tad Cook, K7RA, Seattle, reports: Australia's Space Weather Services issued a geomagnetic warning on December 9 (0132 UTC) to expect increased geomagnetic activity on December 10 due to solar wind from a coronal hole. Both average daily solar flux and average daily sunspot numbers were higher over the December 3-9 period than over the previous week. Average daily sunspot numbers increased from 41.6 to 48 and average daily solar flux rose from 97.2 to 102.2. Geomagnetic indicators rose at well, with the planetary A index rising from 9.9 to 12.6 and the mid-latitude A index from 6.6 to 11.1. Predicted solar flux for the near term is 115 on December 10-12; 120 on December 13-15; 115 and 105 on December 16-17; 100 on December 18-26; 98 on December 27; 95 on December 28-29; 98 on December 30; 100 on December 31; 105 on January 1-2; 100 on January 3-4, and 105 on January 5-11. Predicted planetary A index is 32, 28, and 20 on December 10-12; 16, 8, and 6 on December 13-15; 12 and 8 on December 16-17; 5 on December 18-26; 18, 15, and 10 on December 27-29; 5 on December 30-31; 15, 20, 18, and 10 on January 1-4; 8, 12 and 10 on January 5-7, and 8 on January 8-11. Sunspot numbers for December 3 through 9 were 47, 25, 41, 38, 50, 58, and 77, with a mean of 48. The 10.7 cm flux was 94.5, 97.6, 100.5, 102.2, 100.7, 111.2, and 108.8, with a mean of 102.2. Estimated planetary A indices were 4, 5, 16, 24, 20, 11, and 8, with a mean of 9.9. Estimated mid-latitude A indices were 3, 4, 14, 26, 16, 9, and 6, with a mean of 6.6. In this Friday's bulletin look for an updated forecast and a report from N8II on the recent CQ World Wide CW DX Contest. Send me your reports!